A school that refused a mother permission to take her two daughters out of class while she has a heart operation is "inhumane", she has said. Emma Payne, 37, from Burnley, wants the girls to take five days off school while she has surgery in Newcastle. St Augustine of Canterbury Primary School had only allowed the girls - aged eight and 10 - two days off as it was too near SATs exams, she said. The school said it could not comment on individual cases. Lancashire County Council said the decision rested with the head teacher and "each request is always taken on its merits". Ms Payne had open-heart surgery two years ago but has since had complications. She is due to undergo a pulmonary valve replacement with a specialist surgeon in Newcastle to rectify the problems. 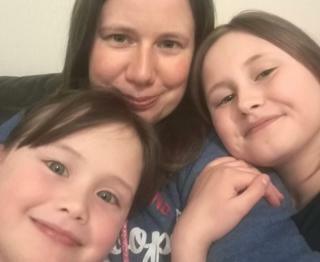 She said the date could not be changed and she had no childcare for her two daughters, Charlotte, 10, and Sophie, eight, because her husband and parents will be with her. "They've been with me through every stage of this through my life... it's not kinder to leave them at school when I'm 120 miles away. They can't just nip in and see Mum," she said. She said the school was "totally unreasonable" and "inhumane" for only authorising two days absence and had "not taken the situation into consideration". "It's the first time I've asked St Augustine for them to have time off," she added. "I'm doing everything exceptional to do this and the school isn't helping me. "Their education is absolutely imperative... but you cannot compare my life to a SATs score. That is not acceptable, that is not compassionate." She said "it would be absolutely scarring" for her daughters if anything went wrong during the operation and they were not with her and their family. A statement from the school said: "We give careful consideration to each request and review on an ongoing basis. "Even though we work in line with government guidelines which make it clear that absence can only be authorised in exceptional circumstances, we speak with the families concerned each time to make sure that the reasons are totally understood so that every decision is appropriate."